LiveCode LessonsLiveCode LessonsHow to - LiveCode Marketplace Products Data Grid HelperHow Do I Register My Copy of DGH? Click on the Preferences in the DGH's configuration window. Select the Register option button on the bottom of the preferences topics, then click on the Registration Key button. Enter the name and the registration key you received by email, then click on the Register button. 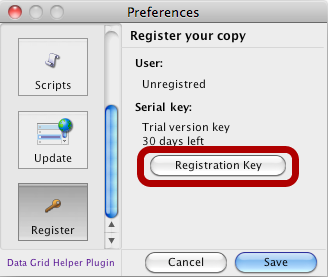 You are now a registred user of the Data Grid Helper Plugin. Thanks for supporting this Plugin! Next: How Do I Create a Menu Button in a Column? How is DGH licensed. If I create my own plugin that uses DGH can I distribute DGH wit that plugoin?